A lot of people asked me about Nonlinear Analysis which can be a quite tricky subject for those who are coming from the linear static world, so I decided to write a post about some of my past experience to give you 5 tips that will simplify your life in nonlinear FEA analysis. To clarify, I will be talking about nonlinear static analysis here, not nonlinear explicit transient which is another (complex) topic. 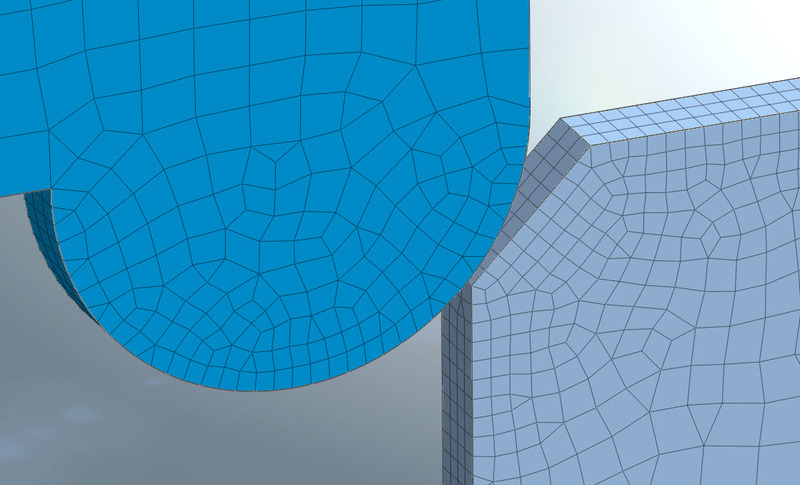 The trick is to create smaller mesh in the area where you need it and larger mesh in areas which are not determinant for either the convergence or the accuracy of the solution. 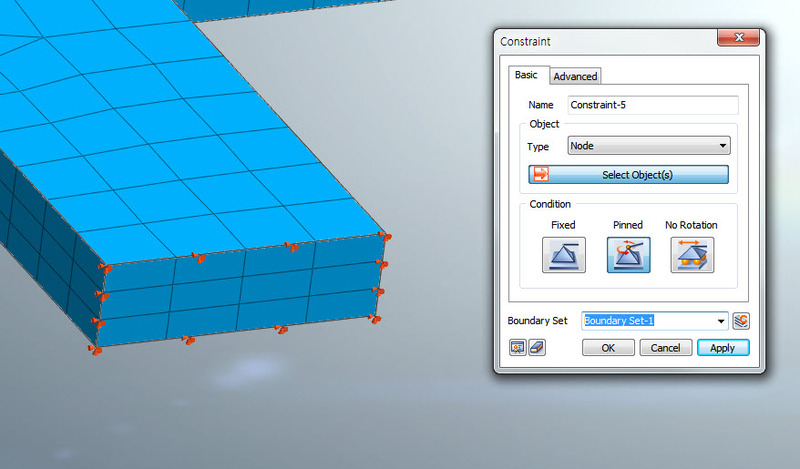 Hybrid meshing will also help you to decrease number of mesh by keeping accuracy at the same time. Don’t listen the guys saying that auto-mesh function will do everything, most of the time, when you want to get accurate results in nonlinear analysis, you will have to create manually your mesh to get nice and regular shapes and results coming with it. If you are getting a singularity error like the error below when you perform your analysis, it is probably that you didn’t correctly set you boundary conditions. 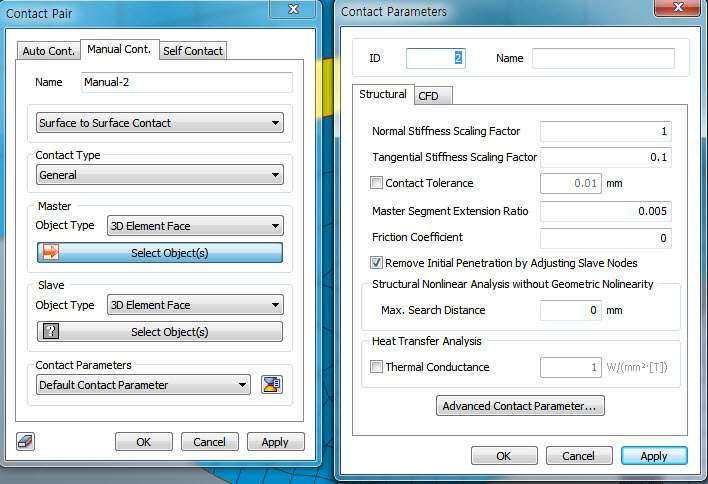 Contact is a very critical part of the model and require a special attention in the setting of the contact conditions. If parts are not in contact at the beginning, general contact have to be used. If “Surface to Surface contact” is chosen, Master and Slave surfaces are not important, but in case convergence is difficult, “Node to Surface contact” have to be chosen and Master and slave defined correctly (This is important for rubber materials than encounter large deformations for example). Contact algorithm in midas NFX is using the penetration method and Stiffness scaling factor will help to get a better convergence if the contact is too stiff (contact force and stresses will be less accurate in exchange of the gain in convergence speed). If you observe some penetration of the 2 surfaces in contact, this is normal and this is due to the penetration algorithm itself. By activating the contact tolerance option, the penetration will be decreased, but in return more iterations will be needed. For a detail explanation about contacts, you can refer to the second part of the webinar I did previously on the topic. 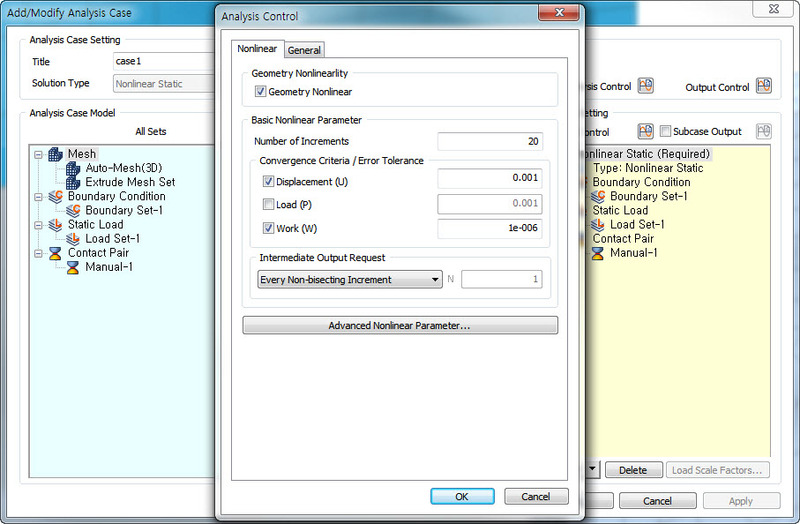 Analysis results and convergence are very dependent of the analysis case settings. This option allow large displacements in the nonlinear analysis calculations and so it is very important to activate it in any case where large displacements have some chance to happen (most of the cases in nonlinear analysis). In Nonlinear analysis, the load or displacement applied is divided into the number of increments defined here. for each individual increment, the stress-strain relation is approximated as the tangent to the initial stress-strain curve. In function of the type of loading (displacement of force) and the shape of the stress-strain curve a different combination of 2 convergence criteria either Displacement+ Work or Load + Work. If you want more details, you can refer to the first part of the webinar I did previously on the topic.